Our Lucky Winner is Lauren! Congratulations! How exciting! Medicine Flower is back with another Rawfully Tempting GIVEAWAY. This week's winner receives a bottle of "Medicine Flower" Vanilla Extract (Retail Value - $22). If you'd like to read more about "Medicine Flower" Extracts, click HERE. 2 - Return here and tell us which product you liked most. 3 - Make sure you leave your email address in the comment. Done. That's it. You are good to go! (Unless you want additional chances to win. See "Additional Entries" and "Bonus Entries" below). *Special Bonus Sample: If you make a purchase, mention "Rawfully Tempting" in Shipping Comments, and Medicine Flower will include a Special Bonus Sample with your order. ADDITIONAL ENTRIES: Want more than one chance to win? MANDATORY ENTRY must be completed before any ADDITIONAL ENTRIES can be submitted. Submit a separate comment for any of the following below, that apply to you. Each entry needs a separate comment. (DO NOT put multiple comments together in one entry, please). A - Follow Rawfully Tempting's Blog - leave your ID NAME. B - Become a Rawfully Tempting "Like-it Fan" on Facebook. C - Follow Rawfully Tempting (Not2RAWnchy) on Twitter and leave your Twitter ID. D - Purchase any products from Medicine Flower during this Giveaway. "GIVEAWAY - Enter to Win a bottle of gourmet Vanilla Extract. (Retail Value - $22) http://ow.ly/22oKe - @not2rawnchy"
F - Vote in the Poll in the upper right hand corner of this page. Tell me which flavor you selected and if you like, what you would do with it. - Be sure to leave an email address and your ID for Twitter, Google, or FB (first name) in EACH comment. 2 - Enter TWO separate comments to qualify. Entry Example: "I blogged about your giveaway @www.yourblog.com - 1." "I blogged about your giveaway @www.yourblog.com - 2"
3 - You must include an email address and your URL in each comment. 1 - Grab my button from my sidebar and post on your blog sidebar. Entry Example: "I posted your button @www.yoursite.com - 1." "I posted your button @www.yoursite.com - 2." 3 - You must include your email address and your URL in each comment. SPECIAL BONUS SAMPLE - Mention Rawfully Tempting (in the Shipping Comments) when you place an order with Medicine Flower, and receive a Special Bonus Sample. - Contest begins Wednesday, June 23, 2010 at 3:30 PM, EST. Deadline to enter is Thursday, July 1, 2010 at 11 PM, EST. - Contest is open to all U.S. and Canadian residents, over the age of 18. THIS GIVEAWAY IS NOW CLOSED! THANK YOU!!! I definitely still want to try the extracts most. And the bug spray. crossing my fingers I win, since vanilla is one of my favourites. I'd like to try the coconut extract the most! But the vanilla sounds delicious as well! I voted for pineapple on the sidebar; I'd love to use it in smoothies and in desserts! I like the extracts best. I voted in your poll for pineapple and would use it in my raw pineapple upside down cake. I voted in your poll ...for yyummy Mango! Love Mango ...it's light and citrusy and summery. The aromatic misters look great! I'm a facebook fan: Lauren N.
I'd love their "Heals the Spirit" massage oil for my clients!! I follow your blog and I believe it's under "Kat", my name is Kat Kirkwood. I really am intriqued by the Rose Petal Preserve. I ordered the Coconut Flavor Extract and it is YUMMY!! I use it in water to make sure I get my ounces in each day. Add in a drop of vanilla and you won't believe the taste! Too difficult to select a "favorite." Vanilla, Lemon, and Raspberry are my all-time favorite everyday flavors -- even way above chocolate! I'd love to have some ideas of what to do with the Blackberry. I "like" Rawfully Tempting on facebook and check it out on a daily basis. I appreciate all the great ideas. Love following Rawfully Tempting's Blog. Always something delicious there! Going now to the poll on the blog. Hi Barbara! I hope i'm at the right comment place to enter! I love all the flavors of food so any of the extracts work for me! The body butters sound great. I also like the coffee, dark chocolate and vanilla extracts. TOo many things look good! Ohhhh....I really want to try the mango!! I want the Lavender Floral Water! I voted for Strawberry and I would make cupcakes! I would order the lavender feilds body butter, & would give bedtime massages with it!!! I'd love to try their Bug Repellant. After spending a weekend in the woods soaked in nasty Deet that had to be reapplied almost every hour, I'd love something a little more pleasant. 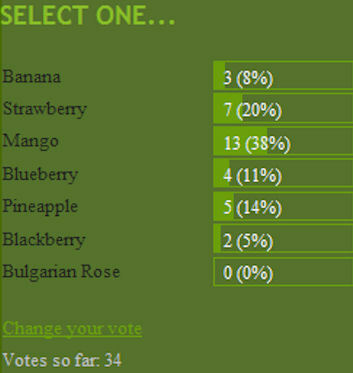 I voted for mango, my long time favourite tropical fruit. Ooh, I REALLY want the rum extract! I can't stand alcohol, but that flavor adds so much to so many dishes...! I voted for blueberry- no other extract could do that blue sweet flavor justice! The passion fruit extract sounds delicious! The Lavender Fields Body Butter sounds like a product I'd like to try. So funny about this contest, I was just thinking yesterday how I need to bite the bullet and invest in some really good VANILLA and I would also love love love some of that Almond (my fav) RUM, Lavender, coconut and cocoa. YUM. I am also a FOLLOWER now, although I thought I already was one...anyway...entry #2! I love misters so would choose Citrus Bliss misters. Entry number two... I became a fan on Facebook (Alicia Bayer). They all look amazing! I didn't even know there was Walnut extract!I can only imagine how delicious it is! I would love to incorporate that into my raw food lifestyle! Entry 1 - Really, all the fruity flavors look good to me!! Entry 2 - I follow your blog! Entry 3 - Im a fan on Facebook! Entry 4 - I follow your twitters! I would love to try the rum flavor. I would love to try the Bug Mist or Bug Oil. The mosquitos love me! I'm a follower of your blog (Kelli Lee)! I'm a Facebook fan of Rawfully Tempting (Kelli Flanders Robinson)! i am in love with the taste and smell of them! i bought the grounding batter for my body that is delicious! I am dreaming with SAGE one! I love vanilla and to add to my green juices will be fantastic! love you dear RAW Fully Tempting that is always send to us a lot of temptations!!! Though I'm really interested in the extracts (especially vanilla! ), I really like the idea of Medicine Flower's bug spray. Neat! I love RAWFully on the web on facebook! Always with some delicious temptations for our daily meal!! i vote in the poll for mango but i am thinking that vanilla is my favorite!